2009 was a great year for X PRIZE and the media coverage the Foundation received helped to mark some memorable events and moments - including the five-year anniversary of the Ansari X PRIZE! 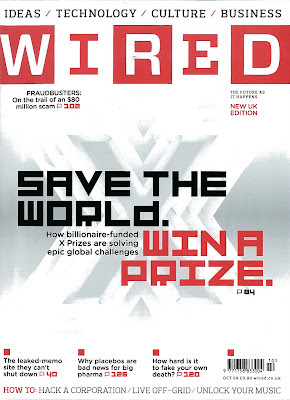 From national outlets like the Today Show and the New York Times to the international WIRED UK, the X PRIZE message was pumped through airwaves, documented in newspapers and pictured in magazines. In no particular order, we’ve compiled a few X PRIZE media moments of 2009. We hope you have already had a chance to see, but if not, enjoy! 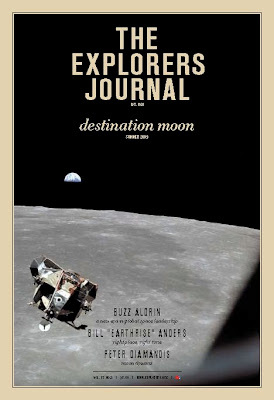 Perhaps one of the most exciting pieces that featured X PRIZE was Bloomberg News’, the “X PRIZE Effect.” The segment was part of Bloomberg’s “Innovators” series and provided an up-close account of the Lunar Lander challenge, including interviews with some of the teams. It also told the X PRIZE story, highlighting X PRIZE CEO/Chairman, Dr. Peter H. Diamandis, and his inspiration and driving force for creating the Foundation. We love it when you can flip through a magazine to find a story about X PRIZE, but we love it even more when our signature “X” lands on the cover! And that’s just what happened with the October 2009 issue of Wired UK. In this cover story, writer Mathew Honan went “Inside the X PRIZE” for a comprehensive profile piece on the Foundation, our mission, what we’ve accomplished and what to expect (not to mention some very cool photos of Peter floating mid-air). It later spotlights the Progressive Insurance Automotive X PRIZE, chronicling a few teams and their accomplishments in the competition to date. Throughout the year, X PRIZE was also featured in outlets like the Boston Globe, Discover Magazine, New York Times and Wall Street Journal. Several X PRIZE stories also featured profile pieces on Peter, including Entrepreneur Magazine, Philanthropy News Digest and Voice of America. Of course, every story about X PRIZE isn’t just about the Foundation. Each of our prizes also generate coverage on their own. The $10 Million Archon X PRIZE for Genomics is always a hot topic in the science world. In April 2009, the Economist’s “Getting Personal” explored genome sequencing. Other outlets like CNN and the Scientific American discussed Knome’s (a genetic firm based in MA) $68,000 genome sequencing auction, which was held on e-bay, with proceeds benefitting our genomics prize. 2009 was an important year for the space community as it marked the 40th Anniversary of the historic Apollo 11 moon landing. Naturally, science publications paid tribute to this event and the $30 Million Google Lunar X PRIZE was included in such pieces as seen in BBC Focus and the Explorers Journal, to name a couple. The prize made additional headlines throughout the year in publications like the Asia Times, Newsweek Poland, and was often discussed on MSNBC.com and Space.com. This year’s Northrop Grumman Lunar Lander X PRIZE Challenge was a rocket showdown not to be missed! Outlets like Discovery News, Los Angeles Times and MSNBC closely followed Armadillo Aerospace, Masten Space Systems and Unreasonable Rocket as they worked rapidly against an impending deadline in their respective fights for that $1 Million prize purse. In the end, Masten Space Systems claimed the prize with their rover “Xoie,” in a sweet victory putting them over the moon (no pun intended). The $10 Million Progressive Insurance Automotive X PRIZE had a busy, successful year and outlets like Popular Mechanics, New York Times, Wall Street Journal and Wired were there to capture events, new partnerships and team highlights as they unfolded. Perhaps you caught the Auto Prize on the Today Show in October? If not, click here to view! 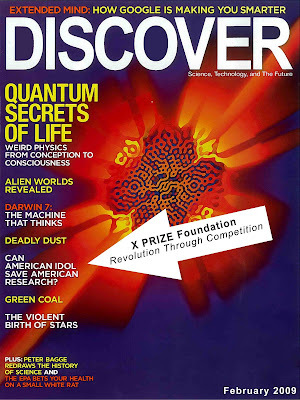 As mentioned above, this is just a quick glimpse of the media attention X PRIZE received in 2009. We look forward to see where we’ll land in 2010. Shall we revisit the Ansari days and land on another cover of TIME? Perhaps a documentary? A stint on Oprah? The possibilities are endless, but as long as you keep reading and hearing about us, we know we’re doing our job! To view a sample of X PRIZE media coverage visit our press album on our Facebook page!